Well it took us long enough!! Lol But, finally, we have a FULL line of pre-sheeted craft vinyls. 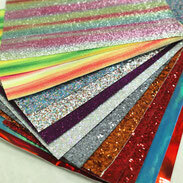 We literally have brought in over 100 colors, patterns, holographic, and glitters. We have noticed the need to service the craft industry. We have modified a section of our warehouse and added individual sections to house all of the Craft Vinyls. These materials are all first run product. What's that mean? well, most of the online materials are seconds or end cuts off of rolls. These aren't. They are taken directly off of master rolls. Everything is listed on the site, under products - craft vinyl. As always, just give us a call with any questions or concerns!